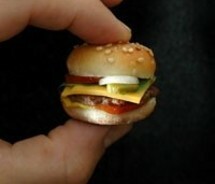 During the 90s many fast food chains introduced sizes in the likes of "super", "king", and "biggie", to name a few. At this point, we knew about the harms of fat and calories, but might not have been so consumed by it --as we are today. Fast forward 20 years or so to 2010. The fast food market is looking to shed its harmful reputation and promote healthier lifestyles through portion control. Celebrating it's 25th birthday, Dairy Queen's trademark Blizzard treat is getting a new size. DQ will be introducing a 7oz. Blizzard, known as the "Mini Blizzard", replacing the 12oz. as the smallest serving for the treat. This trend has also been popular with Burger King, which sold BK Burger Shots in '09, the "short" coffee size at Starbucks, and the "value" size french fry at many fast food locales. As a consolation for the overindulgence introduced to us pounds ago, it appears the message today is "Most things are ok in moderation!"